The English Language Sony DSLR-A580 owner’s manual / operating instructions (Sony calls it the “Interchangeable Lens Digital Camera A-mount α580 Instruction Manual”) is now online and available for download at Sony.com (right-click and save the user guide to your hard drive). If the download link for the Alpha DSLRA580 user manual didn’t work for you, go to the Sony eSupport — DSLR-A580 — Manuals / Specs / Warranty and manually locate the link titled “Instruction Manual (Large File — 11.45 MB)”. 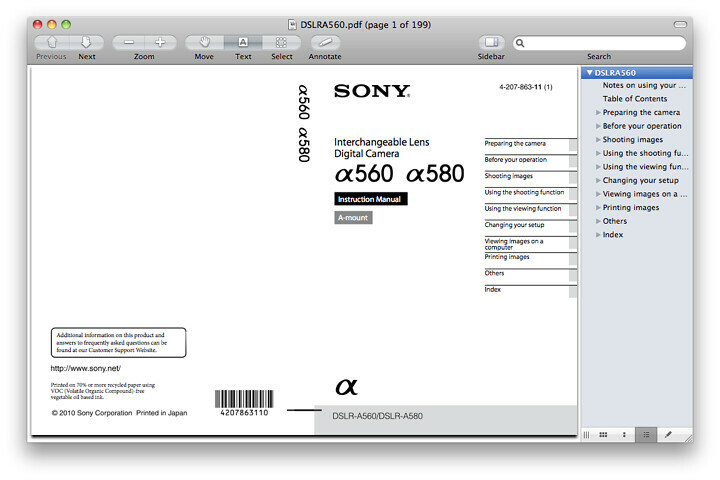 Unlike with Nikon, Sony allows you to freely print the A580 owner’s handbooks without building in any password protection into the PDF. You’re also free to copy portions of text from the PDFs. The file size of 199-page Sony α580 IS Adobe Acrobat PDF document is 11.5 MB (megabytes). The guide discusses the features of the A580, camera settings and how to use the camera. Sony makes two microphones, the ECM-ALST1 compact stereo microphone and Sony ECM-CG50 Shotgun Microphone which specifically mount on to the accessory shoe / flash hotshoe of your α DSLR camera. 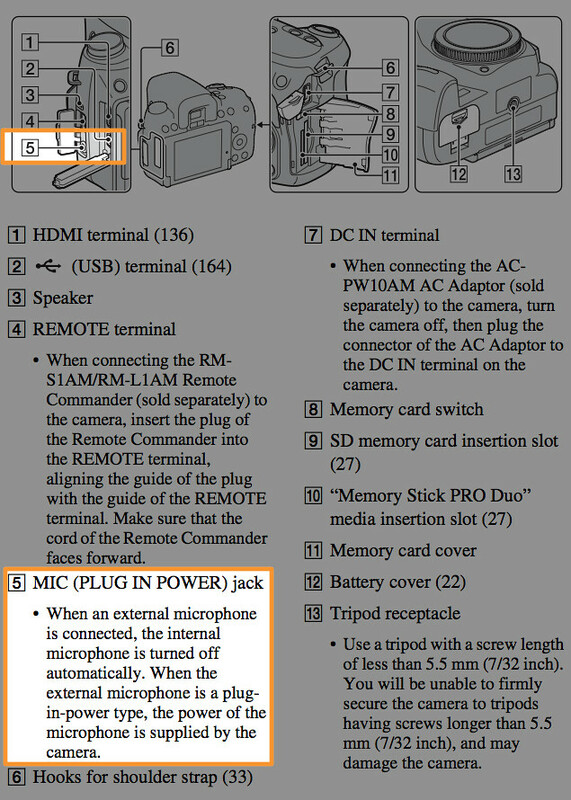 Page 23 of the manual explains how to remove the battery cover before attaching the Sony VG-B50AM Battery / Vertical Grip. 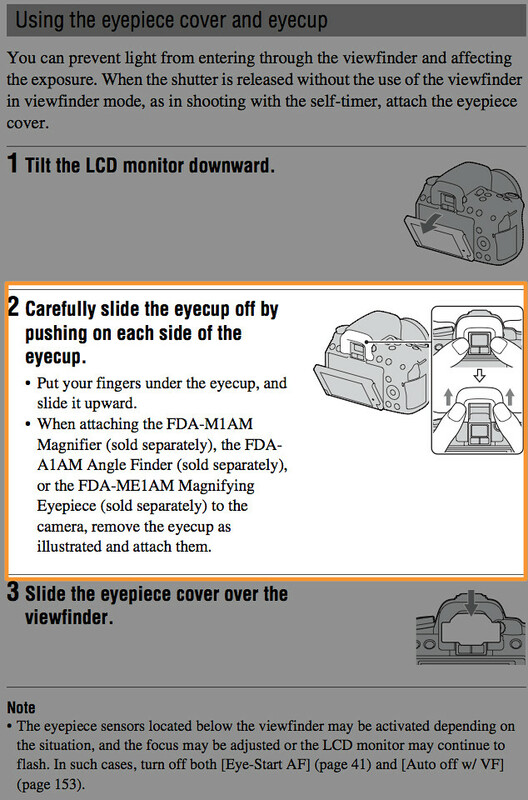 The viewfinder eyecup needs to be removed before attaching the Sony FDA-M1AM 2.3X Viewfinder Magnifier, Sony FDA-A1AM Angle Finder, or the Sony FDA-ME1AM Magnifying Eyepiece. Instructions for doing this are on page 34 of the Sony A580 Manual. 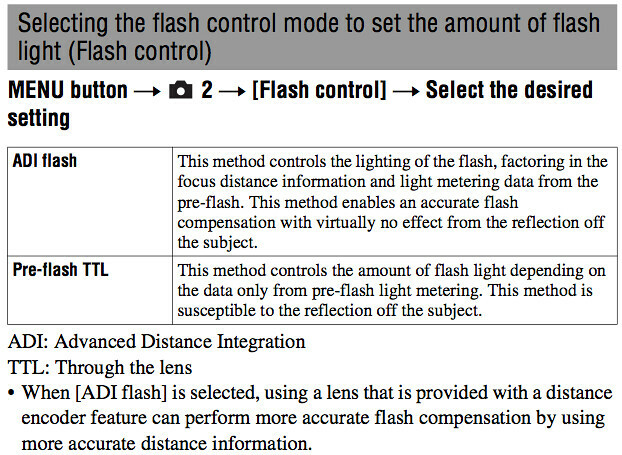 Flash photography instructions for the internal, pop-up flash and external flash units (wireless flash shooting included) on pages 98 through 101 and 105 through 107 of the Sony A580 Manual. Cable / wired shutter release / trigger functionality with the Sony RM- S1AM and RM-L1AM Remote Commanders is explained on page 17. Using the Remote Cdr. setting with the Sony RMT-DSLR1 Wireless Infrared / IR Remote Commander (a variety of compatible, third-party alternatives exist) is documented on page 122 of the Sony A580 Manual. 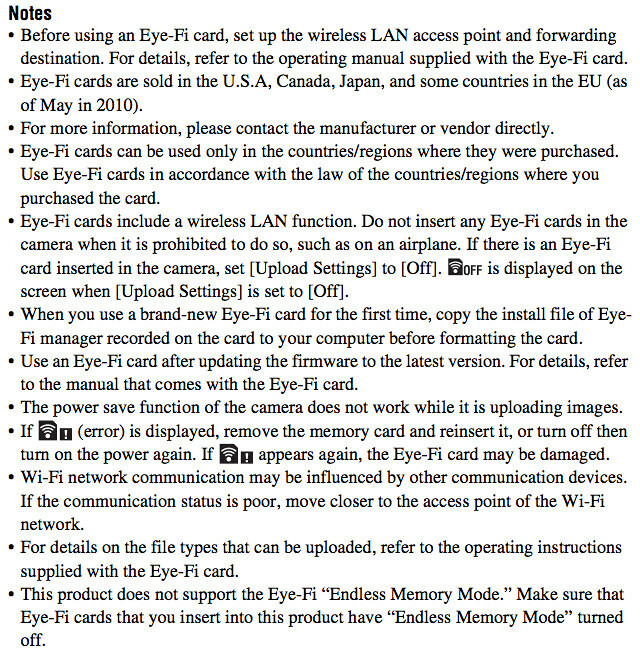 Pages 146 and 147 of the manual has complete instructions on using Eye-Fi SD / SDHC memory cards with the A580. Popular Sony A580 books and other printed literature and reading material in the Arts & Photography and Books section on Amazon.com.